Compare Our Park Model Rentals to Hotels In Lake George! Learn more about our Lake George vacation rentals offered in our comfortable and inviting RV Resort – our unique lodging in Lake George is located in the mountains of beautiful Upstate New York. If you have questions or comments about our family resort in Lake George, or want to know more about how our vacation park model rentals compare to cabins, cottages, or hotels in Lake George, call (518) 792-3775 today or contact us for more information about our lodging in Lake George and reserve your luxury Lake George vacation rental! Our office staff will check availability for you, reserve your luxury lodging rental in Lake George, and send you a comprehensive rental agreement. Our family resort in Lake George will be your home away from home! How many people can your Lake George vacation rentals accommodate? Can I pitch a tent or screen house on the rental site? Is there a VCR/DVD in the vacation rentals? Is there a telephone in the unit? Where’s the nearest location to buy groceries? Is smoking permitted in the rental units? Are your Lake George vacation rentals air conditioned? Can I park next to the rental unit? Are there bathtubs in the units? How can I make a rental reservation? How far in advance should I call? What makes a stay at your Lake George vacation rentals unique? Why is this lodging experience different from staying at hotels in Lake George? 1. How many people can your Lake George vacation rentals accommodate? All of our park model rentals in Lake George now sleep six adults comfortably. We currently offer two Adirondack lodging floor plans with slightly different sleeping arrangements. There are two bedrooms in all of our units. Floor plan one consists of one bedroom which is furnished with a queen-size bed and the other with two sets of twin bunk beds (these bunks offer two sets of twin sized mattresses). Floor plan two consists of one bedroom which is furnished with a queen-size bed and the other with one set of “double-sized” bunk beds (these bunks offer two double sized mattresses – one over the other). Children under the age of six are permitted and the rentals can sleep six people. Twin sized bunk beds may not be appropriate to sleep small children or large adults. You would need to provide your own portable crib and bed rails for young children if desired. Although most units are equipped with a fold-out sofa we do not suggest the use of these mattresses for sleeping. Contact us for more information about our lodging in Lake George. 2. Can I pitch a tent or screen house on the rental site? Tents, screen houses and canopies are not permitted on vacation rental unit sites. A patio and full awning is furnished at each of our park model sites. You are also provided a picnic table, patio chairs, a propane gas grill, and a campfire ring. Propane fuel is provided for grilling and heating purposes. 3. Is there a VCR/DVD in the vacation rentals? No – VCR/DVD players are not provided, but you are welcome to bring your own. There is one color television provided in the living room area and one small color TV located in the master bedroom, with access to free cable TV stations. Most televisions provided have an AV connection, which makes connecting your own equipment easy. 4. Is there a telephone in the unit? There are no telephones or modem access in our Lake George vacation rentals. Connectivity is excellent for most cell phone service providers. Four to five signal bars can be experienced on most phones. 5. Where’s the nearest location to buy groceries? The French Mountain Trading Post located next to the office, sells an array of milk and bread products and other convenience food items. In addition, there are two major food markets within four miles of our lodging in Lake George. See your vacation guide when you register for a map and directions to these local markets in Lake George. Vacation rentals are provided with trash bags, toilet paper, coffee filters, broom, vacuum cleaner and dust pan, but you will need to furnish other household products including paper towels, bar soap, dish soap (dishwasher is not furnished) and kitchen towels. 6. What items do I need to pack? Our clean and comfortable park model rentals in Lake George tend to offer more amenities than hotels in Lake George. You can also enjoy the added luxuries and activities of the Lake George RV Park. 7. Are pets allowed in your resort? Pets are permitted in select Wilderness Lodging Units. There is a maximum allowance of 2 pets. All usual pet guidelines must be followed. For specific pet friendly rental units please call our office at 518-792-3775. 8. Is smoking permitted in the rental units? All rental units are non-smoking units. 9. Can I have visitors? 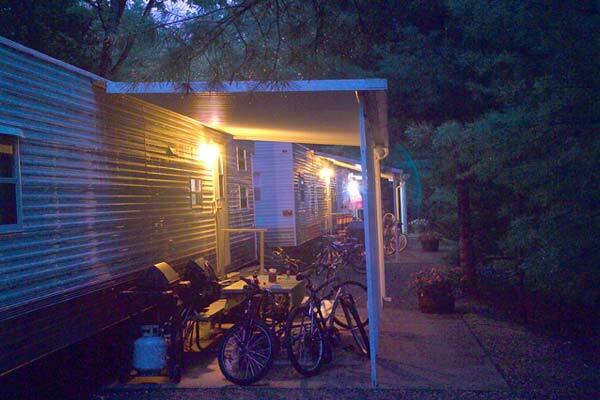 All vacation rental patrons are permitted a maximum of eight persons in the rental or on the campsite at any one time. This includes overnight and day visitors and all persons registered on other sites in the Park. Visitors must register at the office and obtain a car pass. 10. Are your Lake George vacation rentals air conditioned? All of the units at our comfortable lodging in Lake George NY are equipped with central air conditioning. 11. Can I park next to the rental unit? Parking is allowed for one vehicle adjacent to your park model rental. Additional vehicles are directed to park in the nearest public parking area with car pass visible. Boats/trailers and other water craft must be parked in our secure storage area. Contact office staff for daily storage rates at (518) 792-3775. 12. Are there bathtubs in the units? All of our vacation rentals in Lake George are equipped with combination “house-sized” bathtubs/showers. 13. Is there daily housekeeping? We want your lodging experience to feel as though it was your own Adirondack home in the woods. Unlike hotels in Lake George, your privacy is paramount. While housekeeping is not provided during your stay, we make every effort to provide you with clean and comfortable accommodations when you arrive. We really want you to think of this as your home away from home. Your unit is furnished with a vacuum, broom and dust pan. Refuse is to be disposed of daily in trash cans located outside of your rental which is picked up daily. You can take recyclables, i.e. paper, plastics and aluminum, to the nearest recycling station (see Park map for locations). 14. What time can I check-in? What time is check-out? Our check-in and check-out times are designed to assure that all of our guests’ expectations are met upon arrival. It takes our staff time to make our family resort in Lake George your home away from home perfect in every way. Therefore, it is very important that all of our guests abide by these times. Check-in time for all our park model rentals in Lake George is 4:30 p.m. If you should register prior to 4:30 p.m. you may be asked to return to the office at check-in to obtain keys and orientation to your unit by our staff. Check-out time on the day of your departure is 10 a.m. If you wish to stay and enjoy the facilities after 10 a.m. you may register at the office for extended check-out. You still must vacate the rental by 10 a.m., but extended check-out will allow you to park your vehicle in a designated area and utilize facilities until 6 p.m. that day for a nominal flat rate. 15. How can I make a rental reservation? How far in advance should I call? You may make a reservation for our park model rentals in Lake George, NY by calling our office directly at (518) 792-3775 or by visiting our reservations page. When reserving a lodging unit, you will be provided with a comprehensive rental agreement. Our office staff begins taking reservations for rentals and campsites on the 1st of October every season for the following year. It is advised to call early for optimum availability. Our Adirondack lodging rental agreements have been designed to assure that our guests have a complete understanding of the vacation experience that we offer prior to your arrival at our park. We want all of our guests to be 100% satisfied upon arrival. 16. What makes a stay at your Lake George vacation rentals unique? Why is this lodging experience different from staying at hotels in Lake George? Whether you stay for a week or a weekend, you will feel more at home in your private Lake George vacation rental than in a typical hotel room. Here, you don’t need to share walls with other guests, or be bothered by the noise of elevators. You will discover your own lodging retreat in the woods, where you can enjoy the peace and quiet that only nature can offer. Each private Lake George vacation rental offers 400 square feet of space, which is larger than what is offered at most hotels in Lake George. Inside, you have a full kitchen, two separate bedrooms, a private bathroom with a full size shower/bathtub and a spacious living room area. Outside you can enjoy the fresh air on your covered patio outfitted with patio chairs, a picnic table, gas grill and outdoor fireplace. You won’t find those amenities at your typical hotel! Enjoy resort quality amenities in a fun-filled, family oriented atmosphere at our unique lodging in Lake George! You will also have unlimited access to everything the RV Park has to offer on its 120 acres of beautiful property. 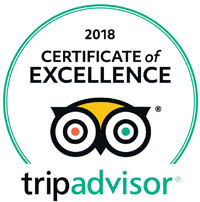 See why we are the best family resort in Lake George for location, accommodations and entertainment! Very clean, neat RV park. Always polite, helpful staff. Keep up the good work.